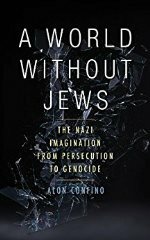 Alon Confino’s A World without Jews is an engagingly written interpretative essay that is squarely situated within a now very prominent tradition of Holocaust historiography emphasizing memory, sentiment, and imagination: a number of Confino’s earlier works have in fact significantly contributed to establishing this strand of literature. Confino chiefly aims to explore the role of a general German National-Socialist “world-view”, or “culture,” a concept denoting something less specific and explicit than the more old-fashioned “ideology.” This general approach has evolved from social history’s emphasis on individuals’ agency--which includes that of perpetrators as well as victims and “bystanders”--and the role that the construction of meaning plays for it: people do, or refuse to do, things because they “construct” or “imagine” these things as somehow meaningful, or not, which does not necessarily require them to have adopted or developed anything like a coherent sociopolitical program. This type of social history, articulated in the sign of the “cultural turn” and, more recently, the “history of emotions” and “sensibilities,” has allowed interpreters more easily to take account of contradictions, inconsistencies, and plain irrationality, which earlier historiographies have often, albeit by no means always, tended to downplay. Given that irrationality is a chief characteristic of the Holocaust and, more generally, of antisemitism, it is unsurprising that this historiographical paradigm offers itself to Holocaust studies. A World without Jews is a fine example of this trend, demonstrating the value of a specific, albeit inevitably partial perspective on the Holocaust, namely that of trying to reconstruct why the Holocaust seemed like a good idea to a rather large number of Germans. Confino mentions at the beginning of the book that writing history has for him something of playing music, and indeed the book is written in a style that sometimes recalls the montage technique of a radio play more than that of a scholarly treatise. Confino interweaves memory narrative with interpretative commentary (although the interpretations are not always strictly interpretations of the narratives) and long lists of anti-Jewish laws (thrown into the mix, in italics, without much comment, often resembling something out of Samuel Beckett), and for good measure, quite a few pictures--again, dropped onto the pages for illustration, but not discussed and interpreted in a more formally scholarly manner (a bit like the photos in W. G. Sebald’s novels). The book begins with a scene from the pogrom of November 10, 1938, that Confino, like most English-language historians, calls by the absurdly beautifying name contemporaries gave it: the Kristallnacht. As there was nothing crystalline about it, Germans of my generation were taught at university to call this event the Novemberpogrom. The origin of the word Kristallnacht is unclear, but it was probably first an ironic comment on the bombast of Nazi language, the point being that only the Nazis would have referred to broken windows as “crystals.” This is especially true for its more common form, Reichskristallnacht: Nazis loved to elevate anything by prefixing it with “Reichs.” It seems that the word was quickly appropriated by the Nazis themselves, though, minus the irony. I am still puzzled by finding this strange word being used all over the English-language academic literature without pointers to either its (first) bitterly sarcastic or its (subsequent) euphemistic meaning: its unreflecting use obscures what might have been a small element of cultural-imaginary, but ineffective and failed resistance to the event, which is something that to discuss would have fitted well into Confino’s book. I dwell on this detail as an example for some of the ways in which the book could have been sharpened by reflecting more carefully on some of the finer points of the symbolic and linguistic issues it addresses. In his discussion of the November pogroms Confino highlights as one particularly puzzling aspect the burning of Torah scrolls: “Why did the Nazis burn the Hebrew Bible?” He writes that “this is a good question because in European-Christian civilization the torching of the Bible is bound to be significant” (p. 3), a fuzzy sentence in which the part beginning with “because” does not so much point to a reason but to a conceptual presupposition. Confino’s book does not so much make the argument why this is “a good question” but expects the reader to agree that it is. Those less convinced might wonder how significant it is, and how this argument could be made. He suggests somewhat unconvincingly that extant scholarship had ignored the religious dimension of the Holocaust because of its emphasis on “Nazi racial ideology,” that is, the Nazi aim “to build a racial biological society,” by which Confino probably means a society based on the concept of “race” as understood in biological terms. Conceptually, Confino’s prose is not entirely clear in these matters: he states first that the Hebrew Bible was “a religious, not a racial, symbol” (p. 4), but then (on the same page) argues that “race and religion, which have often been viewed as separate categories, commingled in Kristallnacht”: their “commingling” presupposes obviously that “race and religion” are in fact separate categories, and that the Hebrew Bible is both a religious and a racial symbol at the same time. Further down Confino writes that the Nazi idea of race “was nuanced and multifaceted and went beyond science and biology” (p. 7), for example when they thought of “the Jews” as a “devilish” race: the point is here clearly that they thought about religion in racial terms--which is hardly a shocking discovery--and that the discourse on “race” had social, political, moral, ethical, economical, and indeed theological contents. In this sense the metaphor of the “commingling” is misleading as race and religion are best understood as complementary dimensions of the same set of phenomena: both race and religion are ways in which to speak about and make sense of the social world, and there is overwhelming evidence, also from contemporary affairs, that modern political discourses draw on both of them simultaneously, seamlessly, and unhesitatingly. In spite of the lack of a more precise conceptual framework, this is in fact implicit in Confino’s argument (e.g., pp. 64, 68, 127, 239): he emphasizes that the larger Nazi project involved the creation of a de-Judaized Christianity, albeit some Nazis surely were enemies of Christianity in any shape or form. The burning of Torah scrolls during the November pogroms was part of an effort to “imagine a Genesis,” namely that of a German Christian civilization in which the Jews never played a role, that is, a re-imagining of the past as much as the present and the future. This concept comes very close to the concept of “palingenesis” (not mentioned by Confino) that is now central to theorizations of the concept of fascism.[2.] Confino argues plausibly that close observation of the behaviors and utterances of individuals involved in the (often carnivalesque) antisemitic actions from 1933 to 1945--the temporal range of the book--shows that they were at least partly aware of the transgression signified by this re-imagining. Confino’s unconvincing representation of extant Holocaust literature has been criticized by Geoff Eley, review of A World without Jews: The Nazi Imagination from Persecution to Genocide, by Alon Confino, The American Historical Review 119 (2014): 1636-1638; and Jeffrey Herf, review of A World without Jews: The Nazi Imagination from Persecution to Genocide, by Alon Confino, The Journal of Modern History 88 (2016): 484-485. Roger Griffin, “Studying Fascism in a Postfascist Age: From New Consensus to New Wave?,” Fascism 1 (2012): 1–17. Marcel Stoetzler is Senior Lecturer in Sociology at Bangor University, Wales. He studied at Hamburg University, Germany, and at the Universities of Greenwich and Middlesex (both London). He has held an ESRC postdoctoral fellowship at Goldsmiths College (University of London) and a Simon Fellowship at the University of Manchester. He works on social and political theory, intellectual history and historical sociology, and has lately concentrated on various aspects of modern antisemitism, especially its interconnections with liberalism and nationalism and the emergence of the discipline of sociology.